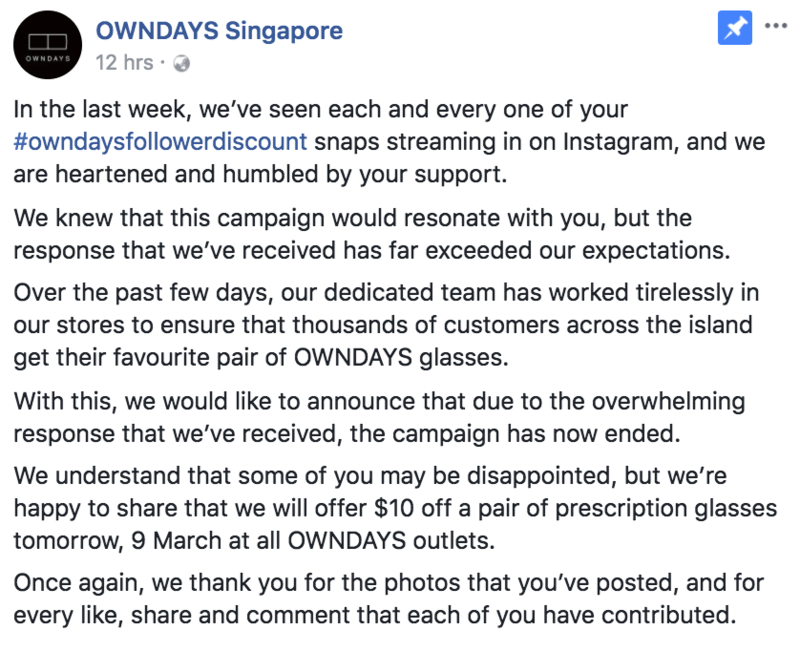 Just 2 days after we talked about how OWNDAYS Singapore’s follower discount campaign was pretty clever in getting them the publicity and participation they wanted, it seems like they’ve just become victims of their own success. At around 9pm last night, they announced on their Facebook page that they’ve pulled the plug on the campaign. Stating that the response had “far exceeded [their] expectations”, they revealed that their staff “worked tirelessly” to get “thousands of customers” their glasses. 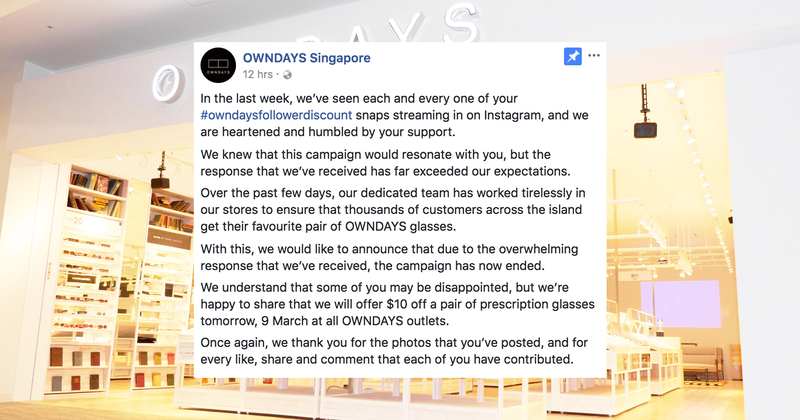 To make it up to customers, they offered a $10 discount for glasses purchased today (9 Mar). The campaign was supposed to last till the end of March. According to some comments, redemption was also stopped at stores before the announcement was issued. 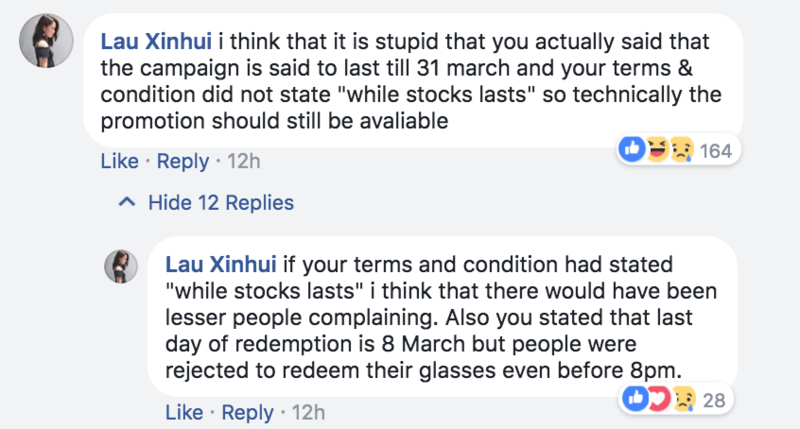 It seems like we have underestimated the desperation (or savviness, however you want to say it) of those who want heavily-discounted/free spectacles. In the few days when the campaign was still running, many gamed the system by engaging in tactics to quickly boost their follower numbers and post likes. Just take a look at the posts tagged with #owndaysfollowerdiscount. 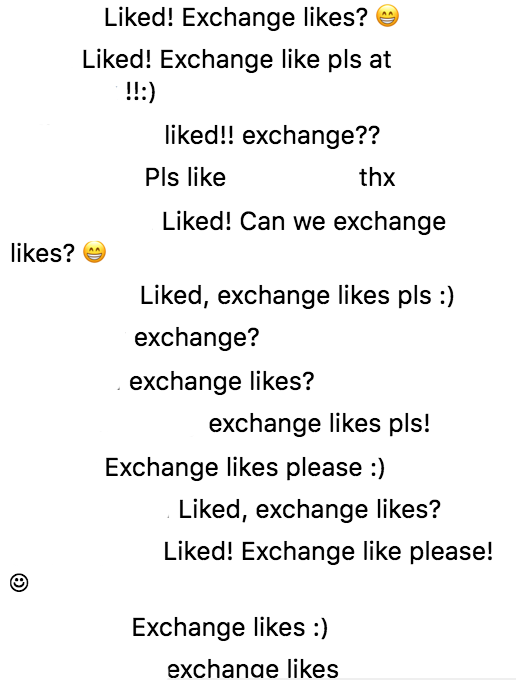 Many of those with hundreds of likes are flooded with comments along the lines of “exchange likes?”, “liked, exchange likes?”. Take a look at their actual follower numbers, and you’ll wonder how the number of likes could be so high, if we were to assume that the engagement was organic. At the moment, there are over 6,000 public posts with that hashtag. 2 days ago, the number was just over 1,000. 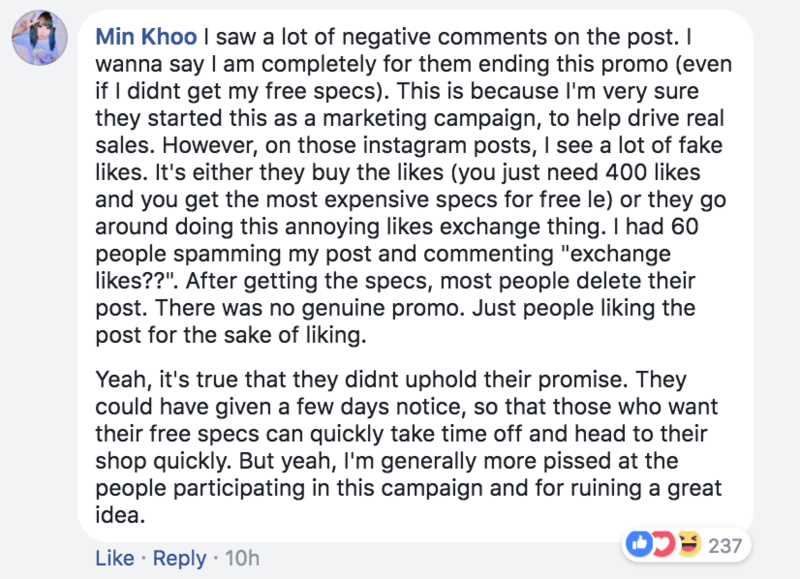 And if what the commenter said was true, that “most people delete their post” after getting their spectacles, there could be hundreds, or even thousands more redemptions that have been made in the past few days. And that also potentially means a heavy, heavy blow to OWNDAYS both publicity and cost-wise. However, all this could’ve been avoided if OWNDAYS had paid more attention to their T&Cs for the campaign. Nowhere in the T&Cs is it stated that they have the right to pause the promotion at any time. 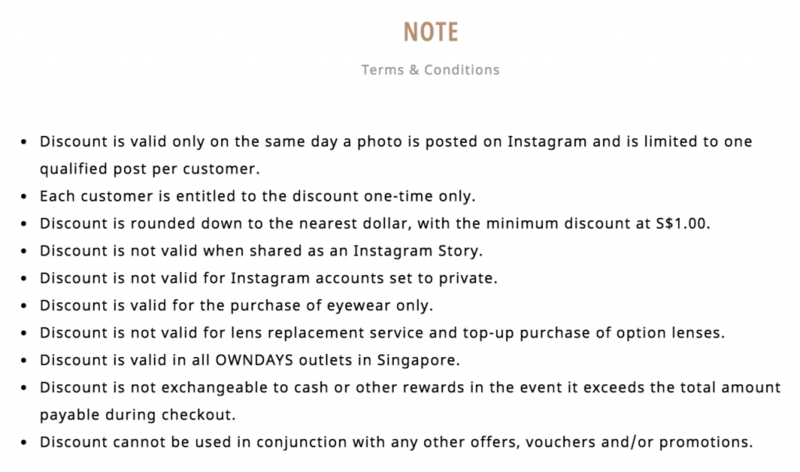 A commenter pointed out that in their general Terms and Conditions page, there is a liner that states that “OWNDAYS reserve the right to amend these Terms & Conditions at any time”, and that customers “should understand that by ordering any of our products, you agree to be bound by these Terms & Conditions”. However, an understanding and acceptance of all terms still cannot be assumed – especially since they didn’t state it on the campaign’s page. But it’s hard to pinpoint the exact culprit. On one hand, we can assume that OWNDAYS started out with the intention to give a manageable boost to publicity, BUT had a grave oversight in creating the T&Cs for the campaign. And for those who gamed the system in whatever ways they did so – there were no rules stating that these tactics weren’t allowed, either. 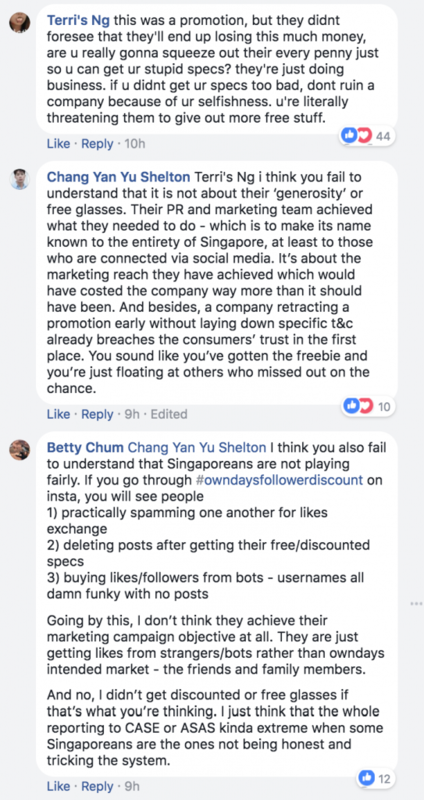 But one thing’s for sure – this will definitely be a great case study for other companies on what to look out for when conducting such a bold promotion in Singapore.